"Will be suited by return to this trip and looks a worthy favourite." Very smart performer who finished second to Masar in Derby at Epsom in June, but hasn't matched that form since, going in snatches when four and a half lengths second to Cross Counter in Gordon Stakes (1½m) at Goodwood last time. Will be suited by longer trip, though, and not to be underestimated. Very smart performer who won Queen's Vase at Royal Ascot in June and Grand Prix de Paris at Longchamp (1½m) in July. Improved again (under burden of 5-lb penalty) when one and a half lengths third to Old Persian in Great Voltigeur Stakes at York last time, left with a lot to do in relation to first two. Will be suited by return to this trip and looks a worthy favourite. Very progressive, winning three of his four starts this season, notably Grand Prix de Deauville last time by two lengths from Master's Spirit. He's one to keep on the right side, particularly if the market speaks in his favour. Smart performer at best, winning Ballysax Stakes at Leopardstown in April, but hasn't progressed from that, behind Kew Gardens in Queen's Vase (third) and Grand Prix de Paris since. 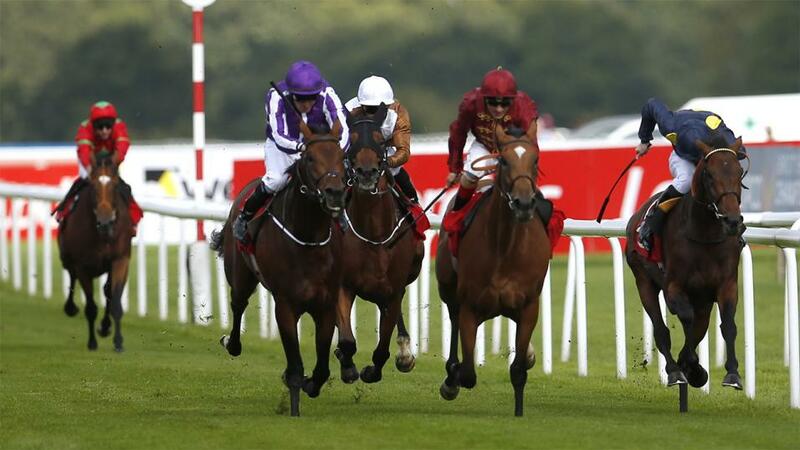 Effectively acted as pacemaker when sixth to Old Persian in Great Voltigeur at York last time. Progressed all year, winning handicap at Newmarket in April and listed race there in May, both over 1¼m. Followed up in 1½m King Edward VII Stakes at Royal Ascot in June and put lesser effort in Irish Derby behind him when winning Great Voltigeur Stakes at York in August, beating stablemate Cross Counter by head. Not necessarily bred for it, but shapes as though he'll be suited by this longer trip, and has to be considered as a result. Big, good-topped horse with plenty of scope. Won 1¼m maiden here in March and 1½m minor event at Haydock (by 11 lengths from Lisheen Castle) in April. Best effort since when one and a half lengths third to Ghostwatch in Melrose Stakes (Handicap) at York last time, but this a big step up. Smart performer who won maiden at Newbury in April and 11f listed race at Hamilton (by two and a half lengths from Austrian School) in July. Only second to Hamada in Geoffrey Freer Stakes at Newbury last time, though, held when hampered, and will likely find at least one too good again. Lightly-raced, well-made colt, who has improved with each run this season, winning 1½m maiden at Leopardstown in May and 13f listed race at Navan (by half a length from Drapers Guild), both in May. Left poorly placed when fourth to Flag of Honour in Irish St Leger Trial at the Curragh last time, and has more to offer, so a bold showing wouldn't surprise. Won twice at two and shaped well when third to Saxon Warrior in Racing Post Trophy here final start in 2017. Has run well without winning so far this season, and wasn't knocked about when fifth to Old Persian in Great Voltigeur Stakes at York last time, staying on steadily. Another who will be suited by this longer trip (half brother to 1¾m Vadamar) and can't be discounted. Big, well-made colt who won maiden (7.5f) at Tipperary in 2017, and standout effort this season came when five and three quarter lengths third to Roaring Lion in Dante Stakes at York in May. Disappointing both starts since, however, and hard to make a case for over this longer trip. Impressive winner of 1½m listed race at York last time by 10 lengths from Light of Joy, leading over three furlongs out and staying on strongly before being eased down close home. Will likely stay this longer trip. Rather unfurnished filly who has made up into a smart performer this season, winning four times, namely 1¼m handicap here and 1½m handicap at Goodwood, both in June, and three-runner March Stakes at Goodwood last time, pushed out to beat Ben Vrackie by one and a quarter lengths. Had the option of Park Hill Stakes but connections supplemented her for this race on Monday, and she shouldn't be underestimated. Kew Gardens shaped with plenty of promise in the Great Voltigeur last time, and is respected, whilst Lah Ti Dar has leading claims following her declaration for the race. However, there are several horses that could improve for this longer trip, notably Dee Ex Bee and The Pentagon, and it could be worth siding with both at a double figure prices. They will both be suited by this galloping track and are both long overdue a crack at 1¾m.